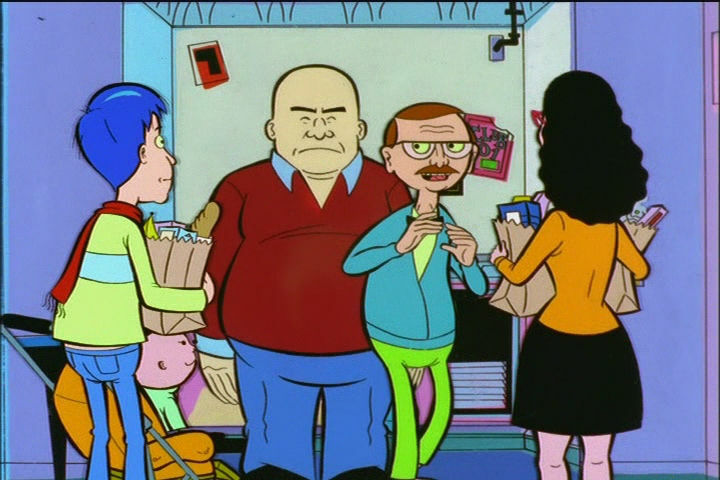 This week’s minorities in cartoons entry is “Mission Hill,” an animated series that aired on The WB from 1999-2000, and Adult Swim in 2002. The series focuses on the lives of a group of roommates (siblings Andy and Kevin; Jim; Posey; and Andy’s dog, Stogie). The series is set in a neighborhood named “Mission Hill,” located in a fictional city. Mission Hill is designed to be an amalgam of several real-life neighborhoods in Boston, Chicago, San Francisco, and New York. The aforementioned fictional city (named “Cosmopolis”) is a mix of New York and Chicago. Among the supporting cast (and the characters’ neighbors) include a gay couple named Gus and Wally. Gus is the owner of a neighborhood diner, while Wally’s a projectionist at an art house movie theater. The series avoided the usual stereotypes in depicting Gus and Wally. The series had a short run on The WB, plagued by poor advertising and a lousy timeslot. The entirety of the series’ 13 episode aired in 2002 on Adult Swim. A DVD set of the entire series was released in 2005. The set included five unfinished/partially finished episodes. However, licensing issues prevented including the original soundtrack. Tom Kenny voiced Wally. Kenny’s most famous role is another character that also first appeared in 1999, SpongeBob SquarePants. Here’s the opening credits for “Mission Hill”.